A once booby-trapped home in Salem, New Hampshire, that was destroyed by an explosion and fire on Monday, has been torn down. Neighbors of the man who once lived there are now speaking out about him. A man found dead of an apparent suicide in a New Hampshire home destroyed by an explosion and fire on Monday had multiple guns and dozens of rounds of ammunition and might have been preparing for a confrontation with police. "We don't know if our officers walked in on something he was preparing for," Salem police Capt. Joel Dolan said Tuesday. He said the town was prepared to seize the home for unpaid taxes on Monday. Salem police initially went to the condemned property at 20 Irving St. on Monday night for a neighbor dispute over property lines. A vehicle was seen in the driveway of the home but when officers attempted to make contact, no one inside answered, police said. Officers then heard a hissing noise and smelled the odor of gas. While backing away, they heard a loud explosion and the windows blew out of the house. Police said the house then began to smoke and eventually was engulfed by flames. Following the initial explosion, officials said multiple rounds of ammunition could be heard going off inside the home. 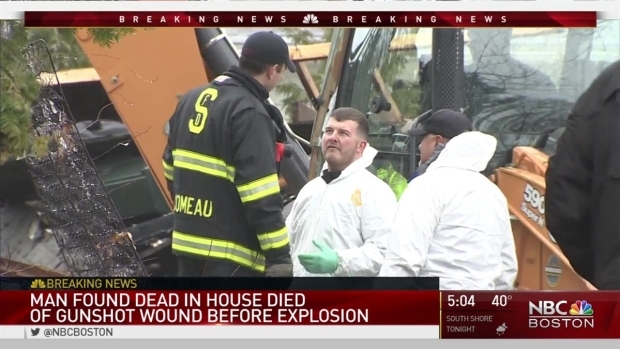 Authorities are continuing to investigate after a body was found in the basement of a house that exploded Monday in Salem, New Hampshire. Firefighters soon arrived at the scene to douse the flames, which could be seen shooting from the home. Nearby homes were evacuated. 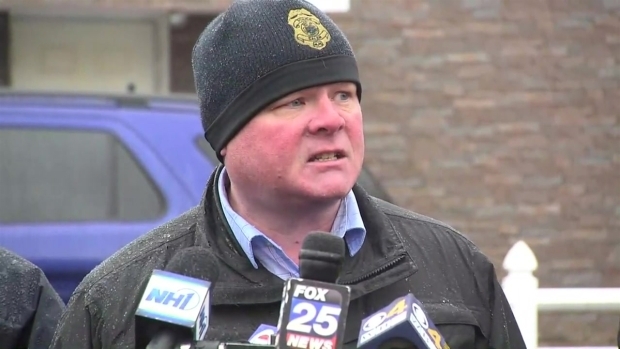 "It definitely looks like this was something that was planned, or at least preparing for police or fire to get close to the residence," Dolan said. "I don't know what the ultimate plan was. The investigation may turn out to prove otherwise, but it does not look like an accident." No first responders were injured in Monday's incident, and neighbors have since been allowed to return to their homes. Salem fire Chief Paul Parisi said the cause and origin of the massive fire remain under investigation, but some consumer grade fireworks were found in the rubble. Investigators weren't able to access the charred remains of the home until Tuesday afternoon after the bomb squad determined it was safe. Boards with nails sticking out of them had been set up along the accessway to the home, so there was some concern that the property might be booby trapped. When they did enter, police found the body of a white male in the basement, with a self-inflicted gunshot wound to the head. A long rifle, a handgun and numerous rounds of ammunition were found around him. According to police Capt. Joel Dolan, a body was found in the basement of a booby-trapped home that exploded Monday night in Salem, New Hampshire. Police said the home belongs to Charles Hill, and his car was in the driveway, but it's unclear at this point if he is the person whose body was found inside the home. Dolan said Hill was estranged from his family, but police have spoken with some of his relatives. According to court documents, the town filed suit against Hill last summer, saying he was in violation of local zoning ordinances and housing standards because of the accumulating trash and debris on his property and that the home was "unfit for human habitation." Water and electricity had been shut off at the property since 2013, and police responding to the home in 2015 observed "rotting food, insects, garbage, unsanitary dishes, and a strong odor of feces and urine throughout the dwelling." By Tuesday evening, the house had been torn down while neighbors looked on. Next door neighbor Betinho Moniz said he recalled the last conversation he had with Hill. "Well, that he was going to put a bullet in my head, ya know," Moniz recalled. "I was in fear for my family all the time." Other neighbors said Hill was not evil, rather misunderstood. "They are making him sound like he was such a menace, he wasn't, he wasn't, he minded his own business," said neighbor Dail Skogstrom.